Is Your Marketing Mix Working? See What Google Is Up To! We all need a MIX in our marketing for maximum success. That includes ways to get new clients, run referral campaigns, develop client retention strategies, do email marketing and so on. I’m a modeller. I look at what others are doing and adapt it. Hey, why reinvent the wheel? Imagine my surprise when a year or so ago I started getting direct mail letters from Google. There’s a photo on the left. 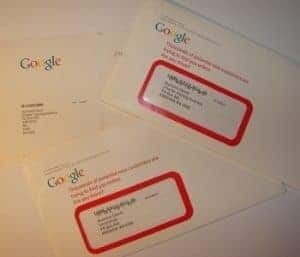 Even Google Use Direct Mail – yup, letterbox stuff! How many of those 63,571 customers would you like? I’d be a happy man at 1/2 % = that’s 317 new clients! I’d love that sort of a cashflow boost! So here’s the mighty Google, biggest search engine on the planet, online resources beyond belief, taking their marketing “offline”. And that’s my point. Be a modeller! A website is just one of tools in your marketing mix. Your website needs to rank well so you get traffic, so you get new takers for your product or services. It also needs to help you establish trust, credibility and position you as the leader in your field. We do particularly well helping our clients in all of the above. But you need more than that. What are you doing with your existing or past clients? It’s like the “diamonds in the farmer’s field” story. The farmer leaves the farm and goes off in search of riches, scouring the world for gold and gems and fortune only to find nothing and come back penniless and disheartened. With no money for food he starts sowing the fields and lo and behold, there’s diamonds in his own fields. So how do you harvest your field of diamonds? How do you tap in to the huge resource of referrals your happy clients could give you? How do you motivate, reactivate or inspire lost, old or previous clients to come back? My business is exactly the same as yours – so many things to do, such little time. It’s needs to be easy – anything complicated and it just won’t happen. It needs to be quick and simple – none of us want to waste our time. It needs to be really cost effective – we’ve already shelled out serious money with marginal results. It needs to be “outside the box” because people are suffering from the “AMEGO” marketing syndrome. That’s the power of postcards and greeting cards. 6 Reasons Why You Should Be Using Postcards and Greeting Cards In Your Marketing Mix! Reason 1: It WILL get read! If you receive direct mail, your name, in a handwriting font, wouldn’t you open it? Postcards and greeting cards have a high impact. Most times we know when a letter is a boring marketing piece. Many people will just throw the letter away without opening it. However, with postcards there’s no envelope to hide the message, it has to get read. A greeting card is the same, it’s thicker, more noticeable and with a hand-writing font it will ALWAYS be opened. It’s almost impossible to throw the postcard or greeting away without looking at its message. Postcards and greeting cards are a low cost way to stay in touch, make offers, include vouchers, send a birthday or Xmas card, get referrals. Reason 4: There’s Less Mail Now Than Ever Before! There is less direct mail now than in the last 20 years. Many people are opting for online bills and email notifications than ever before so as a result there is actually a lot less mail being delivered. Yes, there’s still junk mail, but they are just letterbox stuffers, they get dumped. Reason 5: Updates and Cleanses Your Mailing List. They keep your mailing list clean. One of the benefits is that it will be mailed back to the sender if it has a bad address, which helps you update your list. Postcards and greeting cards are simple to create and send. Have a look at this complete online automated business card system. Your cards are personalised, printed, stuffed, stamped and mailed for you. Simple! Get Some Mix Into Your Marketing! Get your clients actively giving you referrals! If every client gave you only one referral, your business would double overnight. Check it out now and you can test drive it, no obligation, send one to yourself if you like. 5 minutes and you’ll know! You don’t have to touch the postcard at all. It’s all done for you with the push of a button. Click the Smarter Cards link and open up a whole new world of personal, one on one, really impact your clients and relationship building marketing.